"50 million people used to watch him on TV. Now he washes their cars." Dickie Roberts, Former Child Star is about a washed up child star. Dickie became famous because of a sitcom that ended after he had turned six. The movie shows that Dickie’s fame and fortune never returned after the sitcom ended. He works parking cars and is featured on Celebrity Boxing. As far as the public is concerned, Dickie Roberts is a former star. When he hears about a movie that is soon to start shooting, Dickie convinces himself that this movie will ensure his rise to fame. He goes to his agent to get the agent to get him the part. Dickie’s agent tells him that he is unable to audition because he could not preform the role properly. Dickie does not give in and continues in his quest to get an audition for the part. He crashes a Lamaze class which convinces Brendan Fraser to call the director to see if he can get Dickie an audition. The director tells him that the fact is he grew up in the limelight and his mother left him which does not enable him to play the part. After Dickie receives the news from the director, he decides that he will not let this stop him. All he has to do is learn how a person that is not famous lives. Dickie decides that he will prove to both the director and the public that he was born to play this role. He sells a book that he wrote that details his life to pay off a family to take him in as one of their own. Dickie moves in for one month to learn how a normal family functions. As Dickie spends his month with the family, he learns how dysfunctional families are. The movie ends with Dickie achieving his goal and giving up the part to remain in the family that he paid to be a part of. 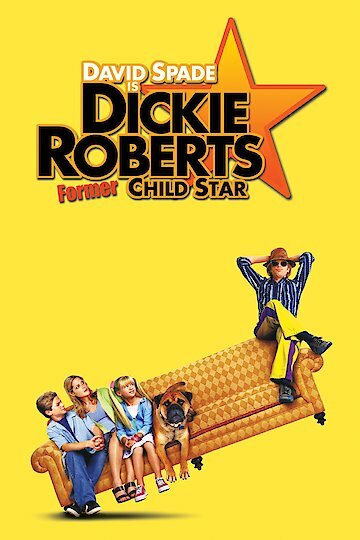 Dickie Roberts: Former Child Star is currently available to watch and stream, download, buy on demand at Amazon Prime, Starz, IFC, Amazon, Vudu, Google Play, FandangoNow, iTunes, YouTube VOD online.